Need to use the Apple logo in a document? Find out here how to make the Apple symbol on Windows and insert it like text (even enlarge it and change its color). from 1975–1987, when the former “O” in the Microsoft logo was formed by the blibbet. The blibbet was a circle with stripes suggesting a disc (a floppy disc), motion, lightness and digitization, I guess. Think IBM, AT&T and Adidas perhaps. When the blibbet was about to be nixed, Microsoft employees campaigned to keep it—but, alas, we cannot easily enter the blibbet in text today using Microsoft’s Windows. We can enter the Apple logo, though, from 1976. Let’s get to it! 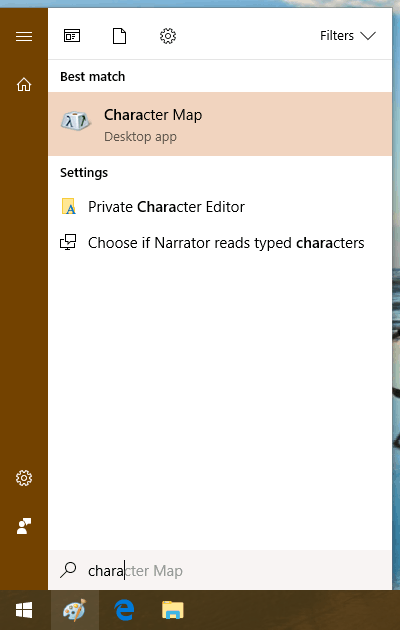 Open the Character Map application. 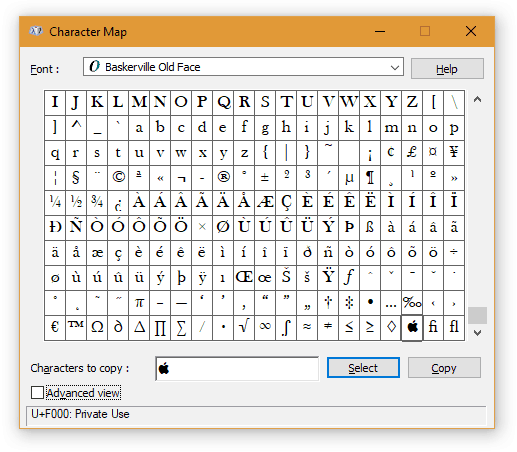 As an alternative, press Windows-R, type “charmap” in the Run dialog and click OK.
Make sure Baskerville Old Face is selected under Font:. Look for and double-click the Apple symbol in the list so it appears under Characters to copy:. If you do not spot the Apple logo right away, you can make sure Advanced View is checked, make sure Unicode is selected under Character set: and type “F000” under Go to Unicode. Make sure Baskerville Old Face is the font selected for new text in the application where you want to insert the Apple symbol. Press Ctrl-V to paste the logo. Now, you can use text formatting tools to edit the Apple symbol, of course: make it bigger or change its color, for example. Do be careful not to change the font as the logo only works in Baskerville Old Face. If you use the Apple logo frequently in Word, you can also set up a shortcut for inserting it swiftly. people using other systems and devices—those using a Mac or iPhone, for instance, or Linux—will see either nothing, a broken symbol or something different altogether. Can I have the Apple logo show on non-Windows systems? take a screenshot and enter that image in your text. Copy and paste  . Do keep the broken symbol intact. Make sure Alt+Numpad is enabled for Unicode text entry on Windows. Hold down the Alt key while pressing + on the numeric keypad followed by F8FF (not using the numeric keypad). 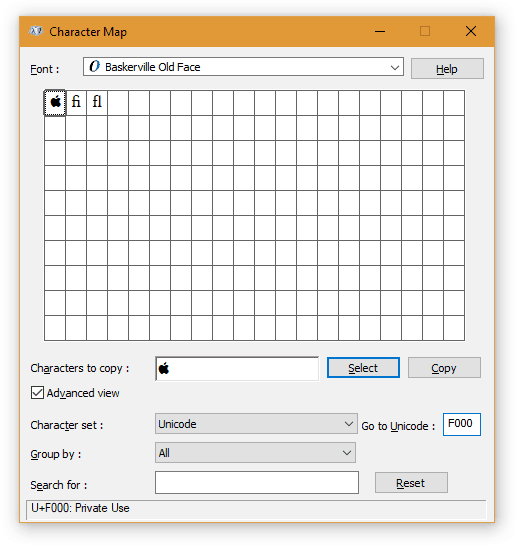 For a handy way to enter Unicode characters on Windows, try FileFormat.Info’s UnicodeInput utility.